In addition to our standard unit, which is assembled on a frame fitted with castors, we offer a wide range of integrated units. 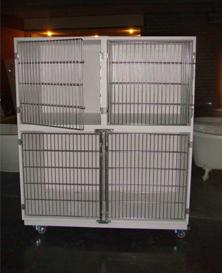 All our assembled and installed units are made of our unique cast material. In addition, thanks to our composite adhesives, the seals are guaranteed to be leakproof. 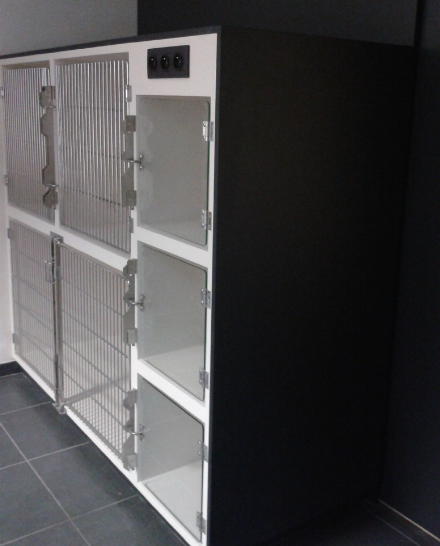 The door systems are tailor-made for Gutmann using very high-quality stainless steel. The units are resistant to uric acid and many other aggressive chemical substances. In addition, a glass variant of the doors is available made of safety or laminated glass. The standard unit is suspended on a frame and is installed flush against the wall. 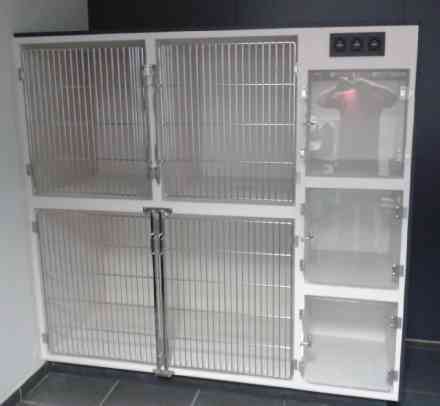 Under the top of the unit there is a hollow section with a front panel behind which utilities such as electrical sockets and connections for oxygen and water can be fitted. 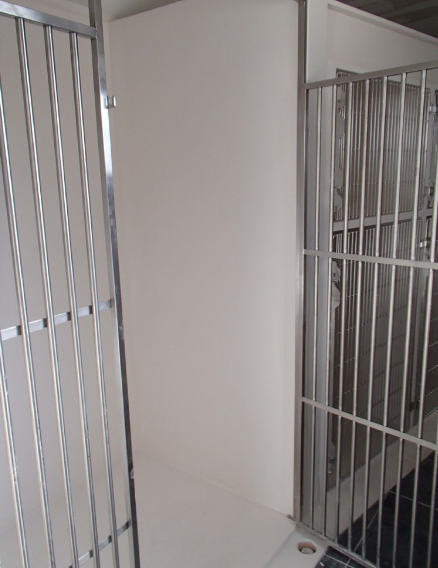 We can undertake total projects with custom-made and fully-installed integrated units. A standard unit project including the top and side trim matching the existing colours and styles with glass doors made of tempered safety glass. 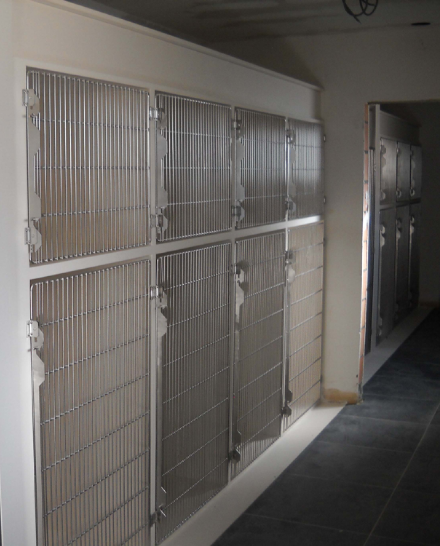 We manufacture a run-in kennel in which 3 mm thick glass fibre reinforced panels are bonded to the brickwork. 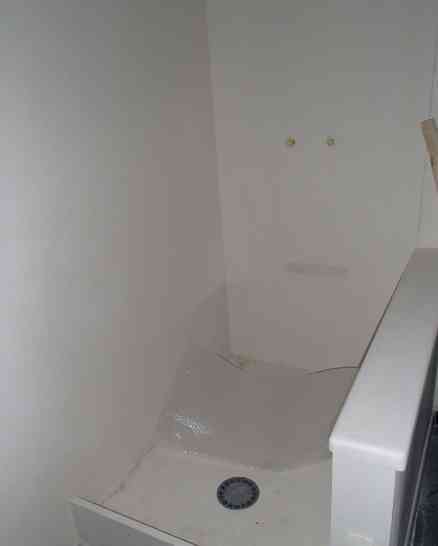 The wall joints are sealed together and bonded to the Buloxiet base using a composite adhesive. 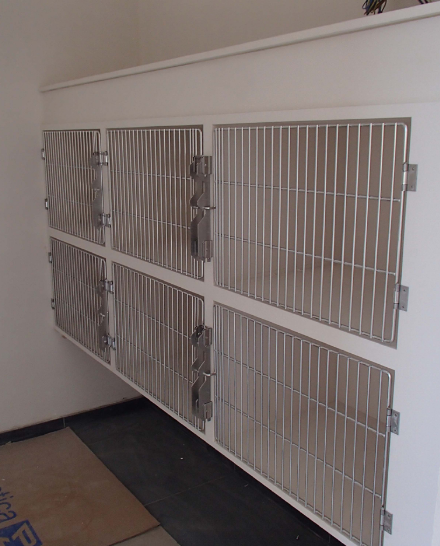 Also, the stainless steel door and the frame are supplied and fitted by us. General: If you have a project or you are currently at the design stage, please do not hesitate to contact us. We will be delighted to offer you our experience and know-how.